Since the first issue of "Literature and its Characters – The Outlaws of the Marsh" released by Macao Post in 2003, the second issue of the series was released in 2014. “The Outlaws of the Marsh” is based on a peasant uprising during the Song Dynasty. Within this framework, the novel features the spirit of freedom and rebellion against unrighteousness and injustice. The work is characterized by its vivid and sinuous plots as well as its individualized characterization. It is a well-received masterpiece known to everyone, with the aim of transmitting the knowledge of Chinese tales to the next generations. Macao Post will launch the thematic pack "Literature and its Characters – The Outlaws of the Marsh" on 1st March 2016. 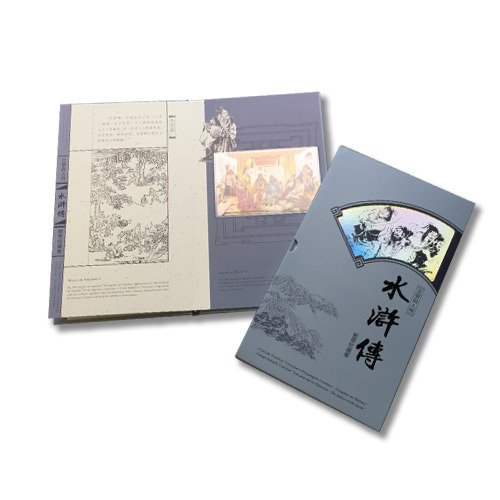 This exquisite pack with the two stamp issues dedicated to Chinese Literature will certainly be a collectable item at reasonable price. The thematic pack is priced at MOP180.00. It will be available for sale at the Philatelic Shop of Macao Post Headquarters, Rua do Campo Post Office, Maritime Ferry Terminal Post Office, Airport Post Office and the Communications Museum. Get the opportunity to add value to your collection!